(2 Customer Reviews) | Write Review 12 issues per year Knitting Magazine is the original and the best magazine devoted to making fashionable knitwear. Whether you are a beginner or experienced knitter, you’ll love the fantastic variety of patterns. Every issue features five or six new fashionable and contemporary knits and patterns, plus a diverse mix of home knits and quick knits to cater for all skill levels. Regular content also includes the latest knitting news, events, yarn reviews, background features, profiles and techniques. Knitting is the most trusted magazine in this popular creative sector. Looking for Knitting in print? Unfortunately pocketmags.com does not sell print copies of Knitting, but all is not lost. Our partner at magazine.co.uk sells print subscriptions at the best prices online. This month is all about transitional pieces for the changing of seasons and comes with a fantastic sock supplement to get you stepping into spring. The issue is filled with 23 beautiful knits in soft pastels and bold shades that can be layered over any outfit to bring you into the new season. Designs include Bronagh Miskelly's stunning green Waterfall cardigan; DesignEtte's Rubia Winter Leaf mixed-patterned sweater; Pat Menchini's pretty Alexia leaf cardigan; and Jo Allport's Lacy Wrap, the perfect springtime layer. Check out the sock supplement for tonnes of design inspiration, handy tips for techniques, hand-dyed sock yarns in stunning springtime shades, and some great patterns. Read about the Dordogne B&B in this month's guest column where alpacas roam the fields and you can find the perfect knitting escape. We also have a profile and pattern from We Are Knitters, the Spanish knitting business making waves internationally. 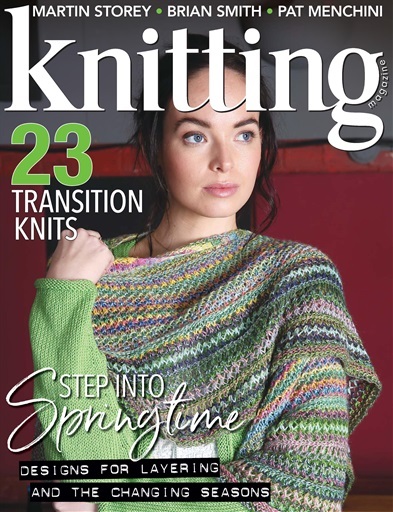 So with all that plus all our regular features, you’ll find plenty of reasons to keep you busy in the May issue of Knitting, out now! 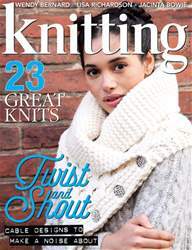 Knitting Magazine is the original and the best magazine devoted to making fashionable knitwear. Whether you are a beginner or experienced knitter, you’ll love the fantastic variety of patterns. Every issue features five or six new fashionable and contemporary knits and patterns, plus a diverse mix of home knits and quick knits to cater for all skill levels. Regular content also includes the latest knitting news, events, yarn reviews, background features, profiles and techniques. 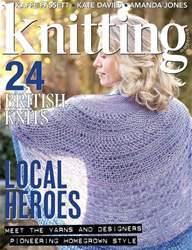 Knitting is the most trusted magazine in this popular creative sector. You'll receive 12 issues during a 1 year Knitting magazine subscription. I'm a fan of the paper magazine and this app is just as brilliant. I didn't have any of the problems described in the other reviews ( I've downloaded 2 numbers so far) this maybe just a different version though. I love this magazine and the easy access to it with this program. 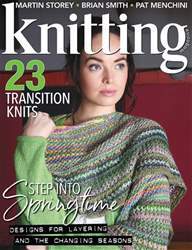 You'll receive 12 issues during a 1 year Knitting magazine print subscription.